It is actually possible that the next few days will offer more locations in the forecast area without rain than with rain! Today and Tonight: A continued trend of fewer showers and thunderstorms is expected this afternoon. Rain coverage will be in the 30 percent range. Most of the activity that can develop should remain south of I-10. High temperatures will eclipse 90 degrees with plenty of early sun. Overnight lows will remain in the 70s beneath mostly clear skies. 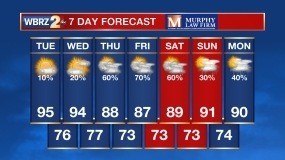 Up Next: Pretty typical July weather is in store for the remainder of the week. Days will be partly sunny and hot with highs near 93 and a few pop-up showers during the afternoon hours. On any given day, most locations will stay dry, but that isolated activity will bring an afternoon cool down to a few spots. Nights will be quiet and muggy with lows near 75. Expect an upper level disturbance to provide another uptick in afternoon activity Saturday through Monday. 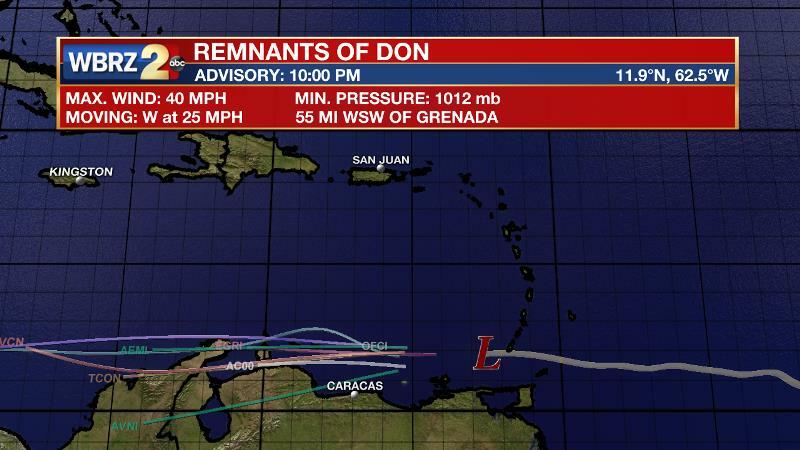 The Tropics: Don has degenerated into a remnant low with a minimum pressure of 1012mb and 40mph winds. Across the Windward Islands, the system will continue westward at 20mph before fully dissipating in the southern Caribbean Sea. A trailing tropical wave in the Eastern Atlantic has a 30 percent chance of development before conditions become unfavorable. An upper level ridge will begin to build southeastward from the Midwest through Thursday. In response to this atmospheric warming, instability will decrease. At the same time, forecast models are showing a bit less moisture available as well. This combination will result in fewer showers and thunderstorms each afternoon; though it looks as though daytime heating and marine breezes will still be able to spark an isolated shower or thunderstorm. 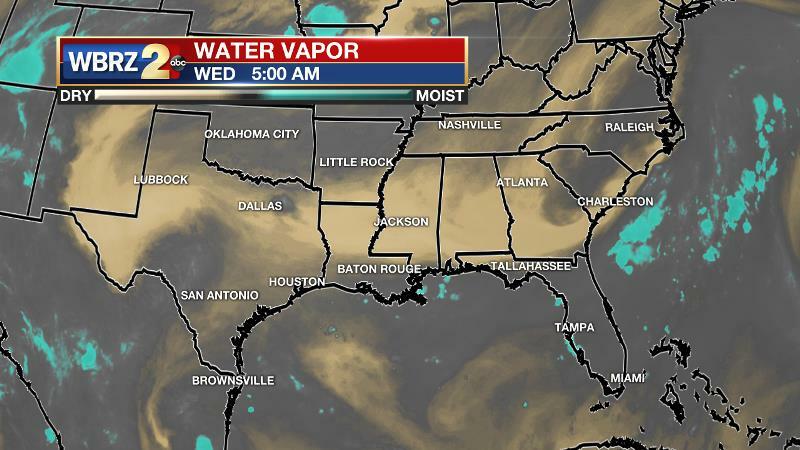 For Wednesday, water vapor imagery shows a much drier mid-level air mass stretching across the Gulf Coast. The HRRR Model seems to be resolving this trend well, holding any shower and thunderstorm development near the coast. While rain coverage goes down this week, the mid-level dry air may mean intensity on the few storms that do develop may increase with gusty winds and frequent lightning possible. The upper ridge will not last long though. It appears as through an easterly wave in the mid-levels will traverse the Gulf Coast Saturday and Sunday before washing out into an open trough early next week. The return of upper low pressure will result in more ascent and the return of scattered to widespread convection. With regard to temperatures, highs will generally stick to the 90 to 95 degree range—lower on days with greater rain coverage and higher on days with lower rain coverage. Particularly on the drier days, heat indices will climb into the 100 to 105 range for an extended period of the afternoons. Lows will be consistently in the middle 70s.